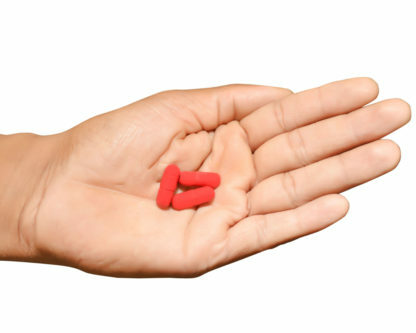 Take 1 capsule from both the formulae three times a day before meals. 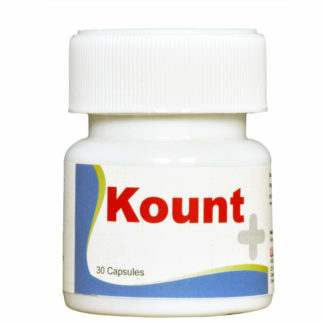 Count: 90 capsules in each bottle; total 180 capsules. The latest development in the infertility science. Complete multivitamin formula with fertility-enhancing herbs. Recommended by OBGYNs and fertility specialists. Promotes female hormonal balance and reproductive wellness. Promotes a healthy ovulatory cycle. The most trusted brand to help enhance fertility naturally. 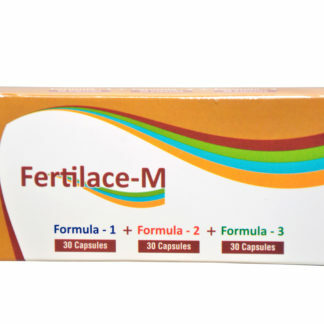 Fertilace F contains all the essential herbs, vitamins, minerals and other nutritive ingredients which increases your chance of getting pregnant. 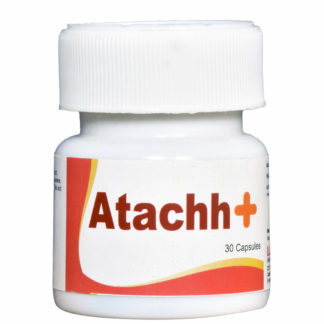 Hence, to avoid doubling of doses, we do not recommend you to take any other supplement for your daily vitamin needs. If you are struggling with infertility due to PCOS or endometriosis, we recommend you to take fertilace for ovum health. Again, to avoid doubling of doses, we do not recommend you to take any other supplement (except fertilace for ovum health). 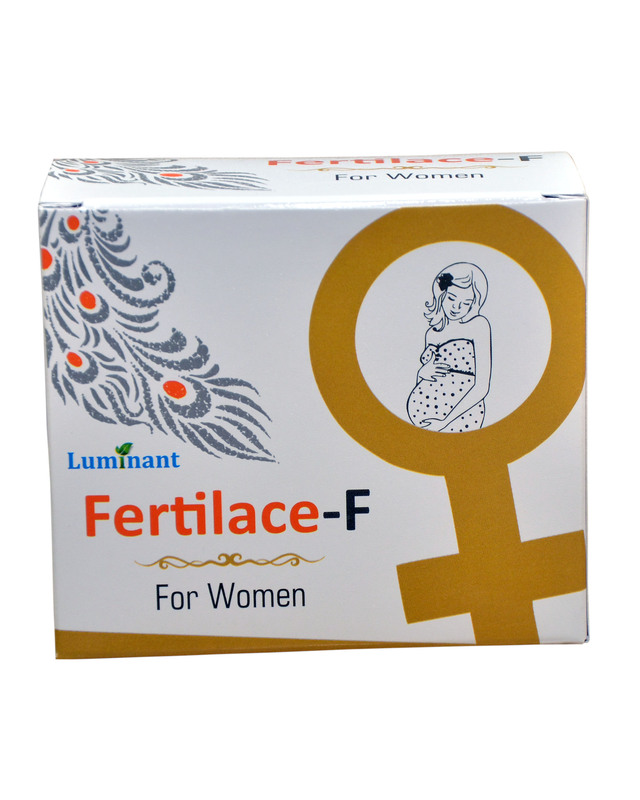 If you are struggling with irregular periods, Fertilace F will help to regularize the periods. Do not take any other supplement to avoid doubling of the doses. 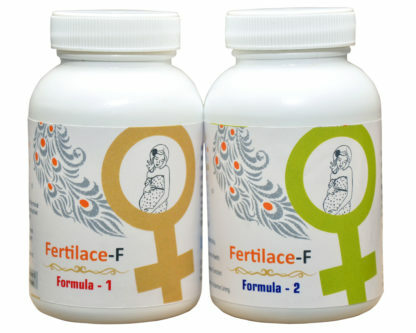 Fertilace F is a supplement specially designed for female infertility. 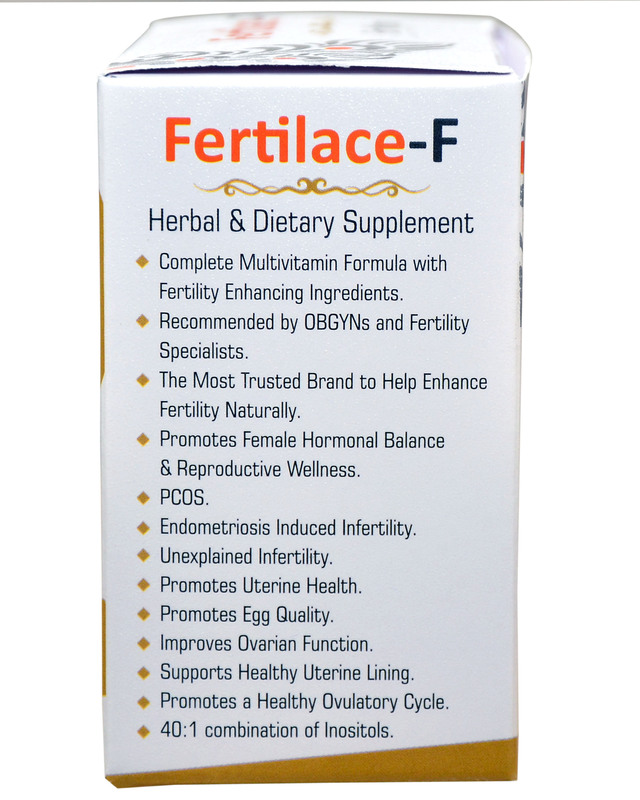 Though Fertilace F contains complete prenatal vitamins, it also contains herbs that are beneficial in treating infertility. Hence, we recommend discontinuing the use of Fertilace F, one pregnancy is conceived. Can a prenatal vitamin be taken with Fertilace F? Fertilace F contains a complete prenatal vitamin, therefore we would not recommend you take an additional multivitamin or prenatal vitamin. Can women with regular cycles take Fertilace F? 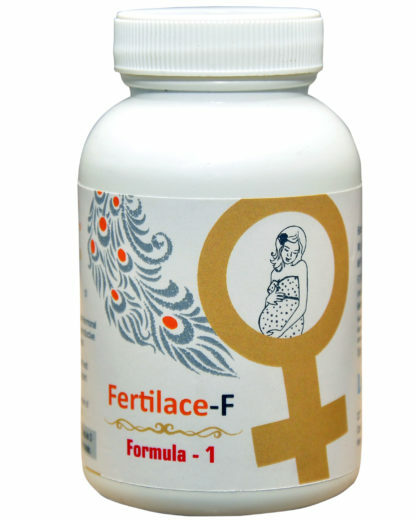 While many women with regular cycles have taken Fertilace F and not experienced any changes in cycles, there are some women who have reported seeing a change in their regular cycles once they started taking Fertilace F. If you have a regular cycle, have no reason to believe that you are experiencing hormonal imbalance or having difficulty ovulating, but are looking for a fertility supplement to support overall fertility and egg health, you might consider using fertilace for ovum health. Do you have to wait for a specific time in your cycle to begin taking Fertilace F? Should Fertilace F be taken during your menstrual period? Yes, you take Fertilace F throughout your entire cycle, including your period. 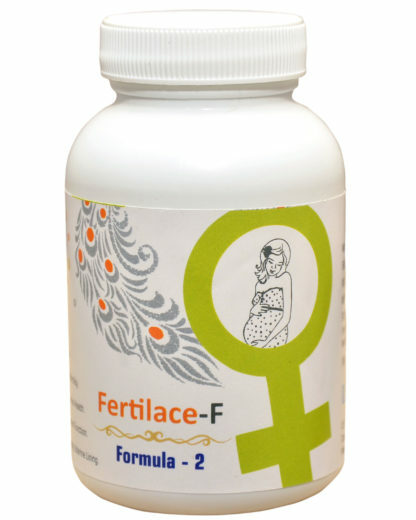 Yes, the formula 2 in Fertilace F is a combination of herbs which helps to restore hormonal balance, which in turn, helps to regulate your menstrual cycle. Does Fertilace F help with ovulation? Fertilace F helps to restore hormonal balance which, in turn, can help to promote regular ovulation. Does Fertilace F for Women improve egg quality? If you are looking to improve egg quality – then we’d recommend you take fertilace for ovum health. Can Fertilace F be taken while undergoing IVF? We would recommend you consult with your doctor before adding an herbal supplement into your IVF regimen. 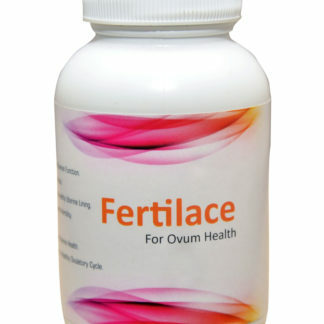 You may want to consider looking at fertilace for ovum health as it is intended to improve the quality of egg. Can Fertilace F be taken while breastfeeding? How should I take Fertilace F? 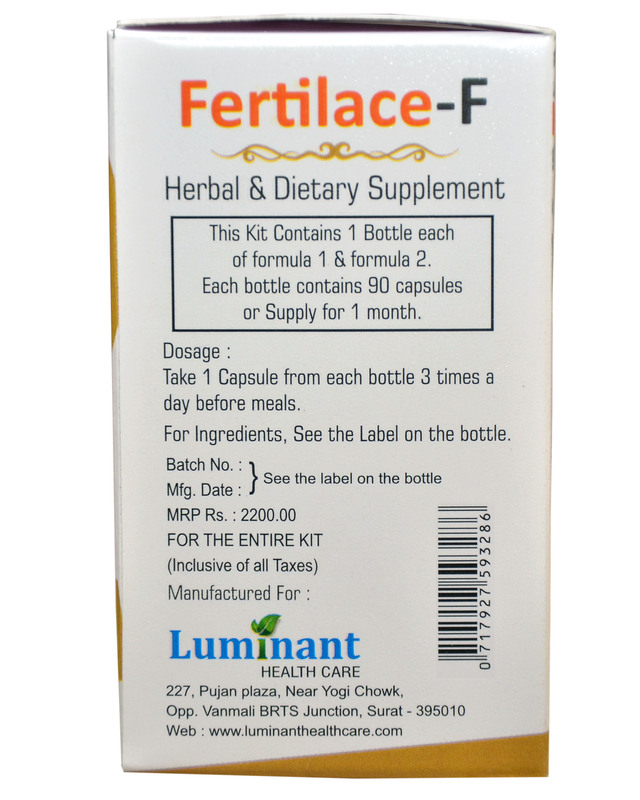 Fertilace F is a kit which contains two formulae – 1 and 2. Formula 1 – Take 1 capsule 3 times a day. 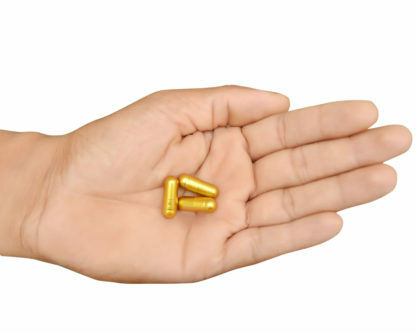 Formula 2 – Take 1 capsule 3 times a day. Take all doses with meals to eliminate any possible stomach discomfort. Is it safe to take Fish Oil with Fertilace F? Yes, you can take Fertilace F with a fish oil supplement. 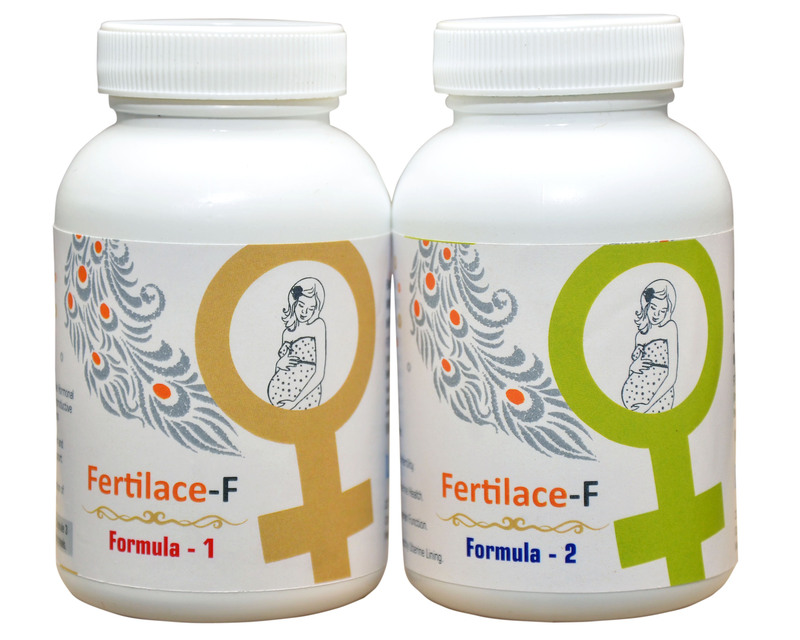 Can Fertilace F increase the chance of conceiving multiples? No, Fertilace F does not increase your chance of conceiving multiples. How long can Fertilace F be taken? 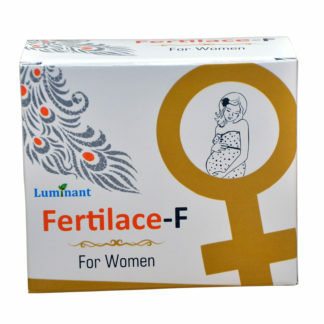 We would recommend you use Fertilace F until you conceive. These are all natural supplements and can be taken for an extended period of time without any issue. Can Fertilace F be taken with blocked tubes? Yes, Fertilace F can be taken with blocked tubes. How long will one bottle l of each formula last for? One bottle of each formula is a one-month supply. Can Vitamin D be taken with Fertilace F for Women? Fertilace F contains vitamin D in the dose of 100% RDA. Hence, we do not recommend you to take any other supplement to avoid doubling of doses. Can Fertilace F be taken with Fertilace for ovum health? Yes, you can combine Fertilace F and fertilace for ovum health – and we highly recommend doing so. Can Fertilace F be taken safely with high blood pressure and high blood pressure medications? Can Fertilace F be taken with Clomid? Can Fertilace F be combined with Metformin? There are no known contraindications of taking Metformin with Fertilace F – however, we do always recommend you check in with your prescribing doctor. Yes, Fertilace F for Women is gluten-free. If you have specific questions, please contact us directly. Will Fertilace F be effective if I only take one capsule a day? Is Fertilace F FDA approved? Fertilace F is a dietary supplement, not a drug. The FDA does not approve or disapprove dietary supplements (like the vitamins you would purchase at your local store).